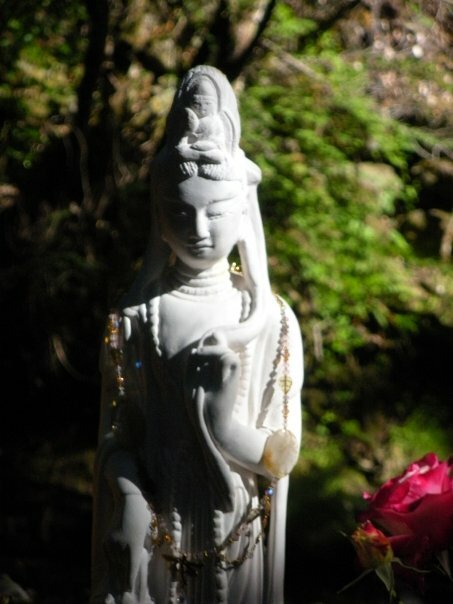 Affirmation: I embody and reflect the energy of the Goddess Kwan Yin, Bodhisattva of Compassion. I love myself, my loved ones and life unconditionally. I’ve built many Kwan Yin altars over the years. She’s one of my favorite to work with. She is the Goddess of Compassion and Mercy. The divine female Buddha whose name means “she who hears the cries of the world.” Kwan Yin is an ascended master who chose to remain in the earthly realms until all other living souls have completed their own enlightenment. I have found that working with her energy has taught me to be more accepting and compassionate both towards others and myself. Often we can be quite hard on ourselves and when I look to Kwan Yin, she alway reminds me to forgive and treat myself with more gentle compassion. Just looking at her statue in this picture makes me smile and soften my energy. She brings about a sense of kindness doesn’t she? When you go about your day today. Think of Kwan Yin and feel her energy. You can’t help but feel loved for everything that you are! And when you feel that way you reflect that out to the world around you reminding others that they too are loved for everything they are. This entry was tagged affirmations, Blaze, Buddha, compassion, divine female, goddess, inspirations, Kuan Yin, Kwan Yin, life, love, Lovelee Day, mercy, Quann Yin, self help, spirituality. Bookmark the permalink.